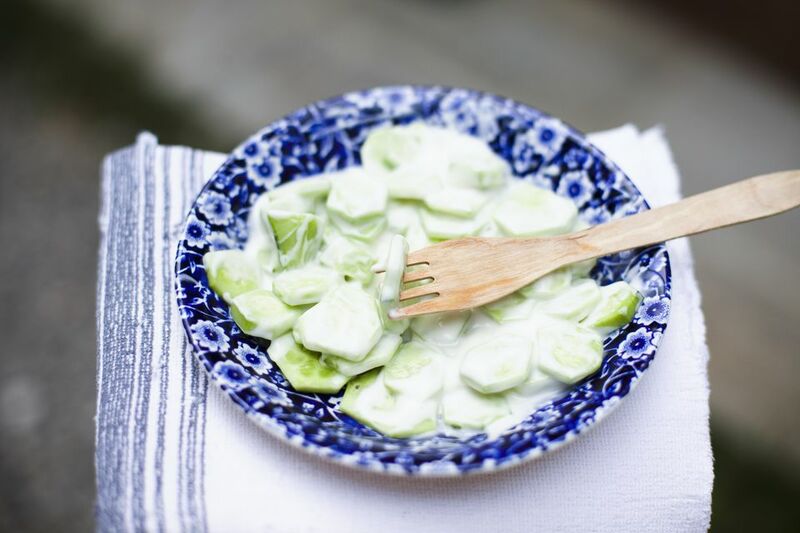 This simple cucumber salad recipe is great in the summer served with a mild, grilled fish, such as trout. It's a cool side dish that doesn't require heating up the kitchen. It also has only a few ingredients, so you might even prepare it while you away from home. Dill is the traditional accompaniment for fish, but not everyone loves the flavor. You can change it up and substitute chives, cilantro, mint, or parsley for the dill for a completely different flavor. See what you have growing in your garden and give it a try. You can use dried herbs if that is what is available. The best tool for this job is a mandoline to quickly slice cucumbers into uniform, thin slices, but you can simply use a knife if you prefer. Peel the cucumbers with a peeler or knife. Thinly slice the cucumbers on a mandoline or with a knife, about 1/4 to 1/8 inch thick slices. In a medium serving bowl, combine the yogurt and dill. Stir to combine them thoroughly. Add cucumbers and stir to coat the cucumber slices completely with the yogurt-dill mixture.